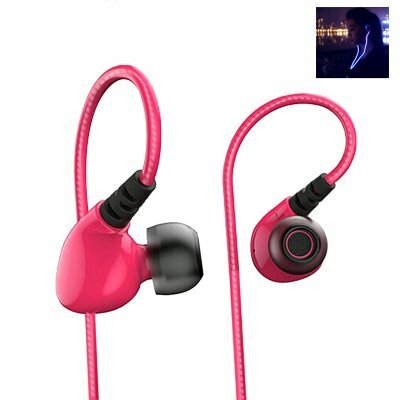 Successfully Added Liberator Fireflies Glowing Sports Earphones - High-Tech Composite Diaphragm, LED, Call Answer Button to your Shopping Cart. The Liberator Fireflies glowing sports headphones have a built in battery and led light that will illuminate the wires for a stylish look. The high tech composite diaphragm and superior sensitivity bring a high quality audio to your ears. With a built in battery the earphones will light up for about 10 hours brining a cool lighting effect. The built in microphone and on line call answer button mean taking a call couldn't be easier. When connected to your Smartphone just click the answer button to take an incoming call and you don't even have to take your phone out. Great when you have your hands full or are out exercising. These wired earphones have a dual insolated copper cable that results in less interference and with a noise isolating desing you can enjoy all your favorite tunes without interruption. The Liberator Fireflies in ear earphones come with 12 months warranty, brought to you by the leader in electronic devices as well as wholesale phone accessories..